British Aerospace's huge maple boardroom table arrived factory finished by it's manufactures. When delivered to site it became apparent that one of the end leaves to the table was glossier than all the others, also there was some rough edges to the underside of the tables edges which potentially could catch the clothing of people seated at the table. We were called in to consolidate the lacquer finish, by dulling down the glossy leaf to match the sheen level of it's neighbours. We also made good to the isolated rough patches on the underside of the table by hand-waxing until smooth. 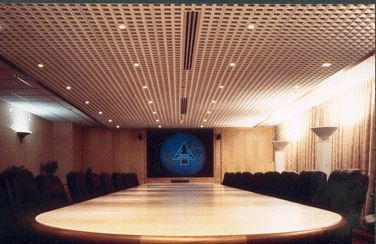 The maple veneered panelling to the audio visual screen had been specially chosen to compliment the boardoom table. Once the table and panelling were assembled on site the client commented on the veneers not matching as well as he had expected them to; Once again we were able to help by hand colouring the finished veneer on site to achieve a satisfactory finish. This is just one example of the many ways we are able to assist our clients, using our experience on site to carry out remedial works that make the end product acceptable.